For some collectors, everything looks better in chromium. 2018 Topps Chrome Baseball takes the existing flagship design and bumps it up another level with that familiar shine. Fans can again pick between the main Hobby box that has two autographs, or the Jumbo Hobby box with five autographs. The same formats existed in 2017. 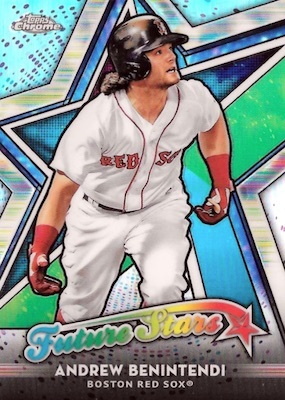 Highlighting top players from 2018 Topps Series 1 and Series 2, the 2018 Topps Chrome Baseball checklist features both veterans and key rookies in the base set. Base Image Variations are in play, as well. However, the real chase gets underway with the rainbow of parallels. The Refractor lineup includes Base, Prism and Negative cards, plus numbered Purple, Blue, Green, Gold, Red (#/5), SuperFractor (1/1) and Printing Plate editions. There are also options exclusive to Hobby and Jumbo formats. These limited Refractors consist of Green Wave, Blue Wave, Gold Wave, Orange (#/25) and Red Wave (#/5). Retail adds exclusive Sepia (Blasters) and Pink Refractors (Value Packs). 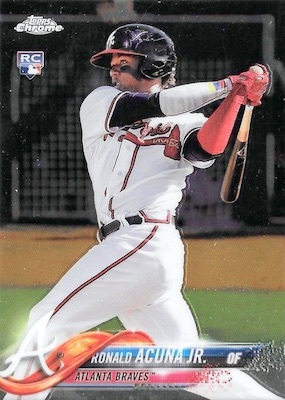 The 2018 Topps Chrome Baseball inserts honor past, present and future with several sets. There is the 1983 Topps Baseball insert in celebration of the 35th anniversary for the release. The subject list includes new options alongside some choices from the Series 1 set. Superstar Sensations is another design carried over from flagship. Meanwhile, Future Stars provides the visual pop for budding talent with a vivid design. Finally, there is also the exciting Freshman Flash for top young players. Insert parallels include Green Refractor, Orange Refractor (#/25), Red Refractor (#/5) and SuperFractor (1/1). 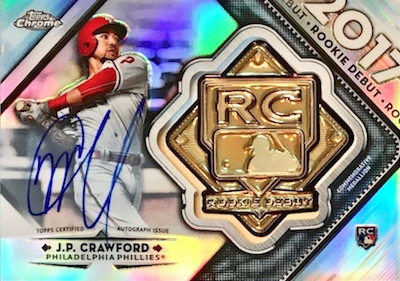 Arguably the most popular aspect of any Topps Chrome release is the on-card autograph assortment, and 2018 Topps Chrome Baseball does not disappoint. The Rookie Autograph Refractor variety includes numbered Base, Purple, Blue, Blue Wave, Gold, Red (#/5) and Printing Plate cards in all formats, while Gold Wave, Orange (#/25), Red Wave (#/5) and SuperFractor (1/1) cards are exclusive to Hobby and Jumbo. There are also retail-only Green Refractors. Other choices include signed versions of the inserts, such as 1983 Topps Baseball Autographs, Freshman Flash Autographs, Future Stars Autographs and Superstar Sensations Autographs. These each offer Orange Refractor (#/25), Red Refractor (#/5), SuperFractor (1/1) and Printing Plate (1/1) parallels. In addition, the all-new Dual Rookie Autograph set adds low-numbered Red Refractor (#/5) and SuperFractor (1/1) parallels. Also debuting in 2018 are the case-hit Rookie Debut cards with manufactured RC medallions. These are exclusive to Hobby and Jumbo formats. Refractor parallels include Green, Orange (#/25), Red (#/5), SuperFractor (1/1) and low-numbered Autograph versions. REFRACTOR PARALLELS: Refractor, X-Fractor (Mega Box), Prism, Sepia (Blaster), Pink (Value Packs), Negative, Purple #/299, Blue #/150, Green #/99, Green Wave #/99 (Hobby/Jumbo), Blue Wave #/75 (Hobby/Jumbo), Gold #/50, Gold Wave #/50 (Hobby/Jumbo), Orange #/25 (Hobby), Red #/5, Red Wave #/5 (Hobby/Jumbo), SuperFractor 1/1, Printing Plates 1/1. 25 cards. Full guide and gallery. REFRACTOR PARALLELS: Green #/99, Orange #/25, Red #/5, SuperFractor 1/1. 72 cards. Shop autographs on eBay. REFRACTOR PARALLELS: Refractor #/499, Purple #/250, Blue #/150, Blue Wave #/150, Green #/99 (Retail), Gold #/50, Gold Wave #/50 (Hobby/Jumbo), Orange #/25 (Hobby), Red #/5, Red Wave #/5 (Hobby/Jumbo), SuperFractor 1/1 (Hobby/Jumbo), Printing Plates 1/1. REFRACTOR PARALLELS: Orange #/25, Red #/5, SuperFractor 1/1, Printing Plates 1/1. 25 cards. 1 per Hobby case. Hobby/Jumbo only. REFRACTOR PARALLELS: Green #/99 (Retail), Orange #/25, Red #/5, SuperFractor 1/1. 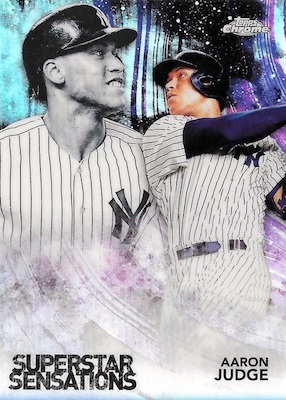 View the 2018 Topps Chrome Baseball checklist spreadsheet. Who wants to guess what cases will cost? Always a good looking set to collect. What is the release date for the 2018 set? I wonder if soto, torres and acuna get their official rc’s in this set. Will there be a retail version? Yep. Retail exclusives are noted in the profile and checklist. Stronger autograph selection than last year. I noticed Mookie Betts does not have a autograph in the Future Stars set or the Superstars Sensatins set. Guess he hasn’t made it yet in baseball. Basic Chrome. Just like everything else this year – the odds are long. I bought some retail already and pulled a Chance Sisco Autograph. I’m seeing some redemptions for this card online, but mine is an actual autograph card. Would there be redemptions in hobby but be live in retail for the same player??? Wow! The autographs were OK. Got a Gleyber Torres Refractor Redemption, but the big hit was an Ohtani Photo Variation SSP Green Refractor /99. I love the look of the cards. I find it funny they included Hanley Ramirez but no Juan Soto. A lot of great rookies. I dont know why topps/bowman always misses the boat with the giants. Miguel gomez??? The giants as it stands in august have the best rookie reliever in the NL, and the best rookie starting pitcher in the NL. They also have several rookies contributing, slater, duggar, black, suarez. The topps chrome update should have like 5 giants rookies in it. The design this year is outstanding. The refractors are amazing! I have already pulled two autos out of retail alone. A Rhys Hoskins purple autograph /250 and a Brandon Woodruff auto as well. I have done very well. Absolutely love the product this year. 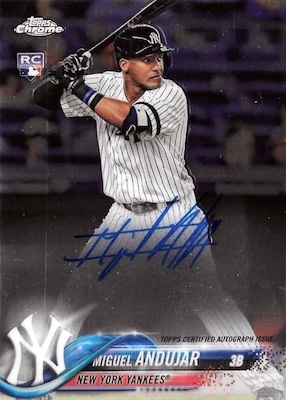 adding so many late 20s middle reliever autos by the boatload – makes this a horrible product..
$200 + for 5 autos and the best one is worth $10 at most….. and the making any of the good ones really short is sad by Topps… if you want to charge those kind of prices give some value in most boxes … not no value in over 95% of boxes. Excellent cards, however, I have a questions about the refractors. I pulled a Cabrera refractor and also a regular Cabrera card. I held them up to the light, looked at them many different ways and the only way I could tell the difference between the regular card and the refractor card is that the refractor card had the word refractor on the back of the card. Is there something else I should be looking for to distinguish the difference between the refractor and the regular card? The Refractor text was added to help collectors spot the difference. Many can identify the Refractor because of the rainbow shine it displays in comparison to the base. In your description, you say there will be no green parallel of the Superstar Sensations, but Inver got the Judge green /99. I’m not a fan of the flagship, but this Chromed out version is NICE. Bought one of the hangar packs, got a Mookie Betts Yellow Printing Plate. Any idea on what the rough value on some of the cards are? Bought 2 jumbos. Got 3 chris Stratton autographs .7 other maybe up and coming. nothing interesting. I see where online dealers dropping prices on boxes. Ill pass next year. Based on various Topps Chrome retail selections from different sources this is absolutely the worst Topps product in 60 years. Duplicates in blaster box case was criminal, base card diversity versus hits equally bad. Wood,Fedde,Inciarte dupes not same w/decent rookies. Lots of refractors, one worthless auto. 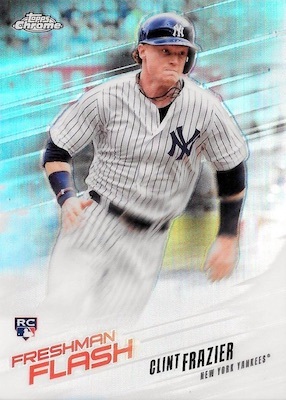 If you spent 1k on Topps and Bowman retail and couldn’t get a set together and your best pull was a Clint Frazier SSP what would you rate this product. Value packs evidently way to go retail. Blasters have the serial numbered color refractors, which make the product this year. Value packs few refractors but ive pulled an auto one in every 6-7 ive opened. The jumbo boxes have been pointless with the exception of x-fractors. At least they’re not 79.99 like Platinum. Limited inserts which I like. Good looking cards. Collation is not too good as I have many dups in base and inserts. Got 3 jumbos boxes and still only 2/3 of a set. Pulled gold rookie Acuna /50, gold wave rookie auto Urena/50 and a Gold rookie auto Robles /50. Other rookie autos were OK , nothing special. Can someone explain this to me please. I just opened a jumbo and only got 3 autos when I was supposed to get 5. Any ideas why that happened? It just means you were shorted two autographs, likely due to a collation issue. Save the box, wrappers, and receipt, and reach out to Topps. Very disappointing. 3 out of 5 autos no-name relievers who shouldn’t even be in there. 1st and last purchase of this product. Great product overall – awesome looking and feeling cards – great refraction. I for one absolutely love this years release. Not sure why but Chrome has not received the hobby love that comes with just about every new product when it initially hits the street… I will admit, jumbo breaks I’ve seen have been horrific but what does one expect when there’s a large checklist? They can’t all be loaded, I’ve done well with regular hobby and retail blasters, not all were winners but I got a pretty decent share of big hits. If it weren’t for a certain few redemptions, I’d buy & stash all I could. I opened two regular hobby boxes and about 3 jumbo and ready to open 2 more jumbos. The past couple times I have opened it, No luck. All poor low end autos.. saying to myself “Who is that?” Chrome is a okay product, not something I would recommend people to open… way to many low end players their prices rarely go for over $50.. thats an ouch. 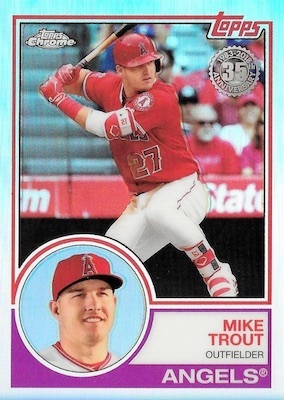 I like the topps chrome this year,i think this years rookies are the best since 2011,if a few key players do half of what people are saying then this will be 1000$ a box in 7 years,squirling away a few packs/boxes might be a good investment for the long haul investors,just think if you would have put a 2011 jumbo hobby update away,or even just a cpl 10$ blaster boxes-lets hope ohtani dosent turn into Todd Van Popple?! ?